If you have weak hair that breaks a lot, is dry, and does not grow well, coconut oil makes for a great solution. Let’s take a look at what we think are the best coconut oil brands for hair growth right now! While the brand name is not very well known as yet, this is our own favorite brand of coconut oil for a variety of reasons. 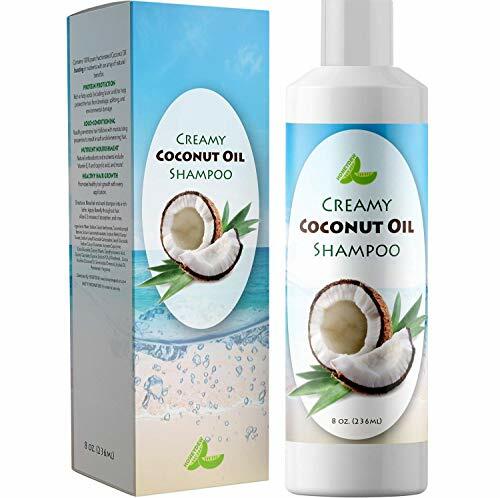 First and foremost, this is a 100% pure and natural fractionated coconut oil product; it does not contain any other additives or ingredients other than coconut oil. 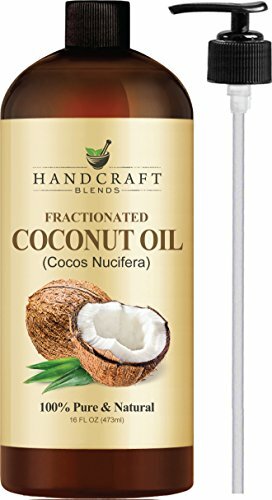 One of the biggest highlights of Handcraft Blends Fractionated Coconut Oil is that it comes with all of the regular benefits of coconut oil, but with none of the downsides. This product is totally odorless, colorless, it is stable, and it won’t stain. Handcraft Blends Fractionated Coconut Oil has many different benefits for hair and for skin. First and foremost, it helps to nourish the skin and hair with certain vitamins. It has the effect of strengthening hairs and hair follicles, making hair more resistant to splitting, and it helps with other things too. Mainly, it makes pores and follicles healthier so hair grows better, plus the moisturizing effects helps to relieve redness, dandruff, itchiness, and general irritation of the scalp. Well, pretty much everything about Handcraft Blends Fractionated Coconut Oil is good. We like how it is colorless and odorless, because it does not interfere with other scents, plus it won’t stain anything. We also like how it is pure and natural, so there is no worrying about other chemicals being put on your skin or hair. Of course, the fact that it makes both skin and hair healthier is another feature that we like. One of the only bad things to speak of here is that Handcraft Blends Fractionated Coconut Oil is quite greasy; it will make you feel pretty slick. The texture is a little weird. Honeydew is a fairly popular brand name, or at least it is starting to be, one that has not failed to deliver a quality product with this coconut oil shampoo. The main ingredient here is pure coconut oil, which is to be expected, but it also contains other things which help with skin and hair issues; the good thing here is that all of the ingredients are natural. The fact that you don’t have to leave this product in your hair, and can wash it out, is pretty neat too. Now, Honeydew Coconut Oil Shampoo is intended to help heal, repair, and strengthen hair follicles so that they produce more and stronger hairs. This oil is intended to work right at the base of your scalp to improve overall hair growth. At the same time, the coconut and other ingredients also help to nourish and hydrate your scalp, thus relieving irritation, dandruff, and more. Also, it helps to strengthen hairs themselves, making them more resistant to breaking. We like how Honeydew Coconut Oil Shampoo washes out well and it does not leave a greasy residue, plus it smells fairly pleasant too. Of course, we like how it effectively helps your hair and scalp become more comfortable, it helps with hair growth, and strengthens existing hair. Since this stuff needs to be washed out, the benefits are not quite as long lasting as with oils that you leave in. Also, the general consensus is that you need to use conditioner after Honeydew Coconut Oil Shampoo because it does not exactly create soft hair. Island’s Miracle has been making this product for a long time and it never fails to impress. Island’s Miracle Best Coconut Oil is very simple and straightforward. It contains nothing else but pure coconut oil, so it is all natural. It has a light coconut aroma that most people enjoy, and its texture leaves hair soft and feeling nice. Island’s Miracle Best Coconut Oil is helps soften your hair, make it healthier, more hydrated, and help stop breaking too. At the same time, it helps to hydrate the scalp as well, thus improving follicle health quite a bit. 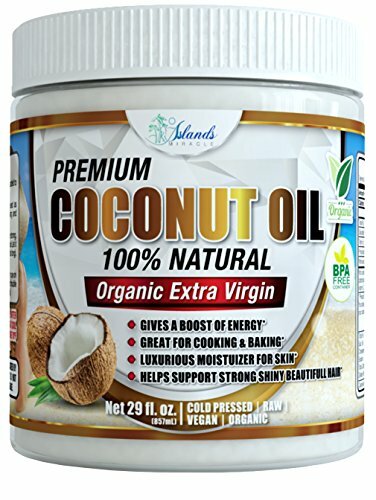 This coconut oil product is great for hair, skin, and can even be used for cooking too. We like how this product is very pure and comes with many hair and skin benefits. It has a pleasant smell – not too strong – but definitely noticeable. What is cool is that you can use this to help improve scalp, follicle, and hair health, plus it can be used for skin, and it tastes great when cooked with. While this stuff product a great job at hydrating hair, it will make it a little greasy. Also, it may stain clothing. Due to the overall benefits which Handcraft Blends Fractionated Coconut Oil comes with, we think it is the best option to go with, but Honeydew Coconut Oil Shampoo does make for a good runner up.